IN 15 YARD ROLLS, CLICK HERE. This pinstripe is Covert, it will not reflect in the visible spectrum. This pinstripe reflects brightly when viewed with night vision equipment. 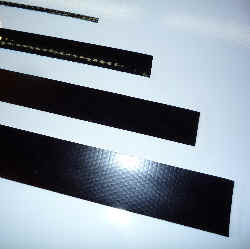 AVAILABLE IN 2 1/2", 2" , 1 1/2", 1" , 3/4", 1/2" AND 1/4" WIDE. Click on the links below if you are looking for regular non-infrared reflective pinstripe.